As we continue to add more of our favorite frugal gift ideas for our favorite GRADUATES we hope you will join us by sending us a gift that you have either made or received! 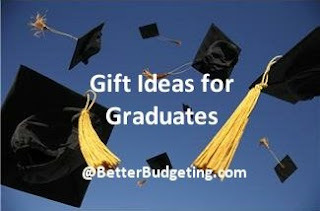 If you have a great gift idea for Graduates that you'd like to share with us, please contact us! "Prepaid phone cards are a good gift to take to college!" - Gary K.
"I recently made up 2 baskets of little things like... thank you notes, picture frame, post it notes, book thong (beaded book marker), mug with 4 homemade coasters, mints, book pertaining to grads or Bible quotes, and lastly, a note encouraging the grad to Hang in There!" - Jessica L.
"White boards with a written message. There are some with preprinted calendars, very handy." - Ray C.
"My personal favorite is a plastic file tote (around $10) filled with a package of file folders and snacks. This way they can use to either store info they need to get their hands on quickly or just keep the insects out of their food. Tie with an appropriate ribbon and you are good to go." - Ray C.
My daughter got several frugal gifts, all very much appreciated: A laundry basket, towels and detergent, A Sun Tea jar stuffed with kitchen hand towels and individual packets of tea, a tin filled with quarters for laundry machines, and an 'office supply' themed gift - a wastebasket stuffed with highlighters, post-its, pencils, notebook paper, pens, labels, and a small desk organizer to keep the stuff in. Even five years post college, she is still using some of the gifts!" - Ann D.
Copyright © by Betterbudgeting.com. All rights reserved. Please note: We update this gift list often. If you would like to share the information with others please provide only a link to this page, or article photo. All content on this site is protected by copyright laws. Thank you for your support!